Today I finally got around to doing two of the classic flatiron routes: the east faces of the first (5.6) and third (5.2) flatirons. I was a bit worried about the non-rappel descent off the third, which involves a 5.4 chimney, but it turned out okay. First up was the first flatiron. The first pitch is intimidatingly friction-y, and I was a bit sketched in a couple places. I got a bit off-route, but backtracked and followed the chalk-marks to the first belay, where someone was busily belaying. After that, the rock became more featureful, and the climbing felt much more secure. I followed the obvious path and hints of chalk for several more pitches, passing another soloist as he rested on a big block, and eventually topped out on the ridge a few pinnacles from the summit. 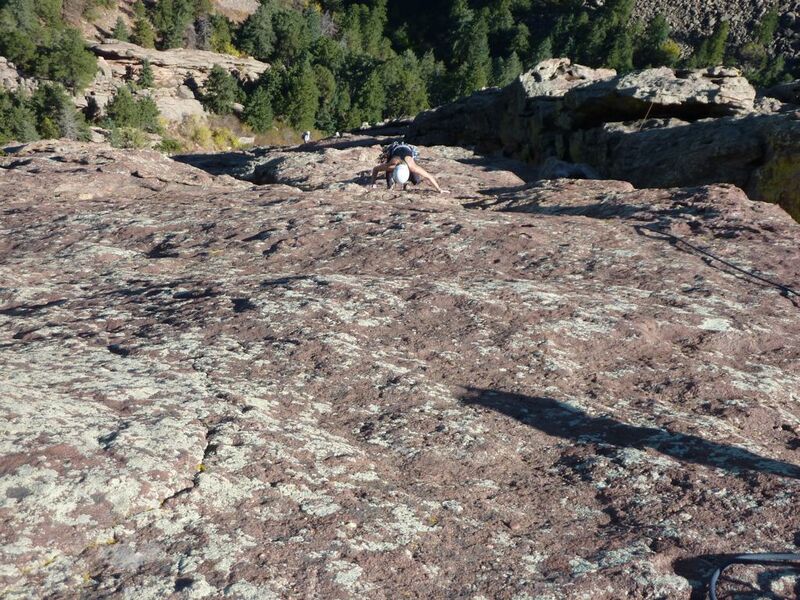 After the familiar downclimb, I took off my torture shoes and schlepped over to the third flatiron. The third is absolutely cruiser until the final 50 feet (the bit you have to downclimb…), where it becomes smoother. Once I crossed the big gully, my climbing was cardio-limited. There were 2-3 other parties on the route, as well as some ginormous eye-bolts, so it was clear where I had to go. Most of the parties seemed to consist of one experienced climber leading while placing almost no pro, and one or more newbies following. I exchanged greetings with the roped folks as I blew past, and made it to the top in something like 30-40 minutes. After talking to a party on the summit, I delicately retreated to the chockstone between the north and south summits. I easily found the tunnel and ledge described online, and the rap bolt at the top of the chimney helpfully told me which way to go and exactly how far I had to descend (148 ft). Going down the chimney was definitely the crux of the climb, with a slightly overhanging section passing a chockstone at the top, and another vertical section farther down. However, there were plentiful handholds, and I usually feel more secure stemming down a chimney or dihedral than trying to stick to a slab, so it wasn’t that scary. As usual, downclimbing was faster than rappelling. I had enough fun that I returned to the start to do another lap. However, as I sat down to change my shoes, I noticed a huge tear in the rear and crotch of my pants. Not wanting to flash my junk at the other climbers, I retreated to the car for new pants, then had another go at the first flatiron. This time I followed a fast soloing couple who chatted the whole way up. I managed not to get beaten by a girl, but it took some effort.